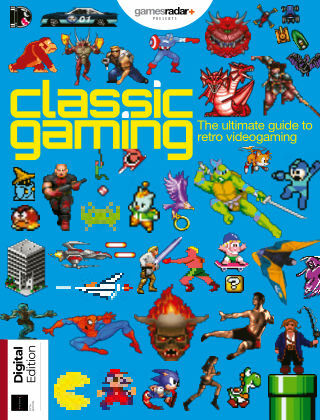 With Readly you can read Classic Gaming and thousands of other magazines on your tablet and smartphone. Get access to all with just one subscription. New releases and back issues – all included. "From Space Invaders and Pac-Man to God Of War and Final Fantasy, Classic Gaming takes you on a journey through the golden age of videogames. Featuring fascinating features, in-depth guides and interviews with key industry figures, it’s sure to bring good memories flooding back. The ultimate guide to retro videogaming The ultimate guide to Final Fantasy - A look at over three decades of the classic RPG Behind the scenes: God Of War - The making of one of gaming’s most brutal titles Game changers: Sonic The Hedgehog - Explore Sega’s answer to Mario Interview: John Romero - We speak to the man behind Quake, Doom and Wolfenstein Also inside... - Pac-Man - Donkey Kong - Resident Evil - Teenage Mutant Ninja Turtles - Castlevania - Blizzard - Destruction Derby - Knights Of The Old Republic - Wip3out - Metal Gear Solid - Tomb Raider - Mortal Kombat - Space Invaders - Half-Life 2 - The Secret of Monkey Island - Micro Machines - Super Mario World - SimCity 2000 - Gradius - Nights Into Dreams - Marvel Vs Capcom 2 - Goldeneye 007 - Super Star Wars - Darius II - Mega Man 2 - Oddworld: Abe’s Oddysee"